Europe is a fantastic tourist destination for so many reasons. You can hop around from country to country, seeing amazing sights, trying different foods, and learning bits of many languages. You may not even stop to think about what you’re drinking along the way. Well, we think you should! There are dozens of European drinks that will introduce you to a very important (and much loved) aspect of the unique cultures throughout Europe. Don’t make the mistake of eating and drinking the same thing as you travel around Europe. We encourage you to be bold and try some of the liquors, wines, and spirits that are made in each country. And don’t forget to check out our guide to learn how to say cheers in all those different languages. If you order like a local and say “cheers” like a local, you’ll fit right at any bar or restaurant you go to. Below you will find 25 European drinks you must try when visiting these countries. These drinks have been submitted by locals who live in those countries and travelers who have “been there, drank that”. In other words, they are certifiably genuine. Belgium is known for its beers and, especially, its abbey beers or “trappists”. Most abbey breweries have their own cafe where you can enjoy and buy the local beer all-year-round, but not so at Westvleteren. The abbey of Westvleteren, officially called the “St. Sixtus Monastery Abbey”, in the West-Flanders province of Belgium is known for its secrecy and the limited period during which it sells its beers to the public. It was founded in 1831 and started to sell its beers exactly a century later. Still today, the brewing is done exclusively by the monks. They only employ three secular workers to help them with some manual labor at the abbey. The monks only brew 70 days a year during which they produce up to 126,000 gallons of beer. It’s in their code of conduct that they can only produce and sell beer to sustain the monastery and so even as demand has increased, they’ve never increased production and don’t make any profit. This is quite remarkable as there’s a high demand for the Westvleteren beer. And it’s not easy to get your hands on some bottles. You first need to call the abbey’s “beer phone” 60 days ahead of time to make a reservation. This you do by giving your license plate number and the date and time at which you’ll come to pick up your beer. Literally thousands of people call the phone every hour it’s open, so it might take you a few attempts. It’s not allowed to resell Westvleteren and so if you ever see a bar or store selling it, you know they’re technically selling it illegally. You can’t visit Bulgaria and not try the national spirit, rakija. Rakija is a fruit-based liquor typically between 40% and 65% alcohol. It’s common all throughout the Balkan countries, but there is evidence to show that the first rakija production was in Bulgaria, since they found a fragment of an 11th century rakija vessel. While the idea behind rakija is the same — strong, fruit-based brandy — every country in the Balkans has their own spin on it. For example, in Serbia, plum rakija is the most popular, whereas in Bulgaria, the most popular kind is grape. That said, you’ll find countless other varieties. I recommend checking out Raketa Rakia Bar, one of my favorite bars in Sofia, if you ever want a good sense of the wide variety of rakijas available in Bulgaria! Rakija is often homemade — don’t be alarmed if you see someone pouring rakija out of a re-used water bottle. That usually means you’re about to get the good stuff! Rakija is served in a shot-sized glass, but you’re actually supposed to sip, not shoot it, despite the strong taste. In Bulgaria, rakija often accompanies the first course, such as shopska salad or other Bulgarian salads, or is provided as a welcome drink to guests. In the summer, it’s served cold; in the winter, it’s often served hot, diluted, and sweetened with honey and spices. But really, rakija can be had any time of day or with any meal — even with dessert! Becherovka is an herbal liquor that is often served as a digestif, after dinner, to help soothe the stomach after a big meal. It’s served cold in a shot glass; though it does have a high alcohol volume at 40%, so it’s also paired with tonic water to make a cocktail called beton, which translates as “concrete”. It’s a really refreshing drink, so I’m not sure that name is fitting, but perhaps not everything can have a direct translation. The flavor of Becherovka is reminiscent of Christmas in a glass – lots of cinnamon and clove. Its refreshing and cleansing flavor is a great way to end a meal, and leave you with fresh breath at the same time. Along with the traditional Becherovka, there is now a “Lemond” version, aptly named for the lemony flavor. It has a lower alcohol level and is served neat in a shot glass. The Czech Rupublic is also well known for their beer. Learn more on a pub crawl in Prague. Said to have been invented in an oyster bar in mid 1800s by James Pimm. The original recipe is a gin-based liqueur made with quinine and fruit with herb extracts. It was served by Mr. Pimm in a large cup, and thus it became known as a Pimm’s No. 1 Cup. If you were to order a Pimm’s Cup today in London, you’d be getting a cocktail made with Pimm’s No. 1 and fizzy lemonade, with slices of fruit and mint sprigs thrown in for flavor and appearance. It’s a very popular summer-time drink in England, because it’s so sweet and refreshing, with a low alcohol level. To properly get in the mood, you need to imagine yourself in an English summer garden, with blooming flowers, large sun hats, and laughter floating through the summer breeze. That’s the perfect setting for a Pimm’s Cup. You can order them in just about any pub or restaurant in London in the summer. If you want to drink like a local, you must order a Pimm’s Cup. For wine lovers, drinking a Bordeaux wine in Bordeaux is special. The region is intensely proud of its wine culture and history, and they even have an entire museum, La Cite du Vin, which is dedicated to the history of wine cultivation. After touring the museum, you can even taste wine at the restaurant or participate in a wine lesson. From Bordeaux proper, you can take day tours to different parts of the region, learning about the various microclimates, like what makes a Medoc different from a Saint Emilion from a Margaux. Booking a wine tour and tasting at one or more chateaus gives you the opportunity to learn about the chateau, taste several of their different vintages, and then compare chateaus within the same area. Unlike some countries like the US, where wine is labeled by the grape, it is these microclimates that are crucial to the qualities of the wine. Wine cultivation was brought here by the Romans, but what you’ll drink in the region today is very different from what Julius Caesar was sipping. However, the geology of the region and the terroir make this a prime place for viticulture, and the technological advances made in the last two centuries lead to this being the first region many people think of when they think about wine tourism. If you are a lover of wine, then you simply must make a trip to the Republic of Georgia. Georgia is slowly growing in popularity with tourists but once word officially gets out that they have an 8000-year-old tradition of making wine and is possibly the birthplace of wine, oenophilia’s all over the world will be flocking to this fascinating and beautiful destination. There are quite a few wine regions to visit in Georgia, each with their own distinct styles, flavours, and even colours. Georgian wine regions are Kakheti, Kartli, Imereti, Racha-Lechkhumi and Kvemo Svaneti, Adjara and Abkhazia. This might mean nothing to you now but the good news is that most of these regions are well set up for tourism with wine routes clearly marked, winery tours and tastings are readily available and even offered in English and many more tour operators are popping up every day taking people on day trips of the regions. Which is great as there are so many tasty wines to try you absolutely don’t want to be stuck as the designated driver in Georgia! One of our favourite wines is Saperavi, which is a red wine from the areas of Kakheti. This particular wine has been produced since 1886 so it’s not one of the oldest in the country but it is certainly one of the tastiest…and they’ve had plenty of time to perfect their formula we’d say! They have even won gold and silver medals at international wine competitions. Saperavi is a very popular grape in Georgia and can readily be found in the capital of Tbilisi on its own or blended with other grape varieties of the region. But if you are looking for a truly unique wine tasting experience we recommend heading to the Khareba Wine Tunnel for a tasting. Here you will find not only Georgia’s largest storage of local wines (25,000 bottles to be exact) but you will find them stored in a 7.7 km long underground tunnel-shaped wine cellar. A unique way to try the finest wines of the Kakheti region. Many German cities have their unique brew of beer, but some also have their own liquors. Killetpitsch is a Krauterlikor distilled only in Dusseldorf. Krauterlikor is a specialty liqueur flavored with herbs, and typically contains between 15 and 44% alcohol by volume. Killepitsch nears the top, containing 42% alcohol. The drink is a product of the Busch Distillery in the Dusseldorf old town. Legend has it that its creator, Willi Busch, was taking shelter during a bomb raid during World War II. He is quoted as having told friends in the shelter, “if they don’t kill us, we will drink (pitsch) to it later.” Thus the name Killepitsch was born. Shortly after the war Willi began importing the ingredients for his secret recipe, which includes 98 herbs, spices and fruit, that are aged together for a year to meld the flavors. Once this concoction is distilled, it is deep red, with a slight thickness. The flavor is quite unique, and somewhat reminiscent of cough syrup. Yet, it is strangely pleasant. The Tasting Institute of Chicago rated Killepitsch as “Exceptional” scoring it the best of all herbal liqueurs. Local pubs in Dusseldorf have created recipes using Killepitsch in long drinks or cocktails, but I prefer it when drank as intended, as a digestif. Slightly chilled and served in a shot glass or measure, after a hearty meal. A younger crowd may drink it down in a single swallow, but a more mature drinker will sip, savoring the texture and the warmth, as well as the swirling feeling of comfort and satisfaction that ensues. Germans are big drinkers, that’s definitely not a secret. However, mostly everyone connects Germany with beer, but there’s more. Schnaps! The word itself describes strong alcohol that comes in different types and forms. Some are super fruity, some are rather herb based, others have funky flavours such as liquorice or artificial ones. The very basic Schnaps is a clear drink that tastes very much of alcohol and usually comes as something that we in Germany call “Herrengedeck”. Translated that would mean something like a gentlemen’s menu. However, if you order a “Herrengedeck” in a German kneipe, which is a typical bar, you end up getting a beer and a schnaps, mostly “Korn” – a colorless distilled beverage produced from fermented cereal grain seed. I mostly enjoy a schnaps after a huge dinner. German cuisine is heavy and sometimes you simply need something to burn the stomach after a feast of meat, potatoes and some vegetables. Hence, a schnaps comes in handy. It’s usually served in small glasses, that we call “shot” or “Kurzer” here and the good thing about it is, that it’s regionally super diverse. You can basically travel through the entire country and find a different type of schnaps in every single bar. Some are handmade, others come from regional producers or big brand names and most of them do have a big history. Also, the mountains mostly call for fruity schnaps. Here you get schnaps with pear mostly. In the North, right at the sea, we either drink super herby schnaps or something very strong that is burnt to make it stronger. My advice: come to Germany and try yourself through all different kinds of Schnaps. If there is one drink that is synonymous with Frankfurt, Germany (and the state of Hessen), it is Apfelwein. Apfelwein is an alcoholic cider drink that usually contains Granny Smith or Bramley apples and can be found ubiquitously in Frankfurt as there are establishments dedicated to its consumption. The extremely tart drink contains anywhere from 5.5% – 7% alcohol and can be consumed as is, or diluted in water or fizzy water. While I personally prefer my apfelwein cold, many will drink it hot as a cold remedy or to warm up the body during the winter season. Apfelwein is served in a bembel of various sizes and in Geripptes, or ribbed, glasses. In Frankfurt, you will hear locals say “Ebbelwoi” instead of Apfelwein as it is part of the Hessisch dialect. There is even a train in Frankfurt called the Ebbelwei Express that takes people around the city to all of the best sights while sipping on the drink! The homepage for the tram even offers a course in the local dialect so you can understand the lingo being used on the journey or at local pubs that sell the stuff. On the tram ride, you will be served copious amounts of pretzels and local Possmann apfelwein. While I have yet to take this journey, it is definitely on my list of things to do once back in Frankfurt and is one of the things I always tell tourists to do when in the city. I prefer craft beer over apfelwein as I don’t have a sweet tooth, but my favorite places for a bembel are at Apfelwein Solzer in Bornheim (local gem) or at the Konstablerwache Weekend Market on Saturdays. Local farmers bring their apfelwein for buyers to try. Pair that with the famous Frankfurt dish “Handkäse mit Musik” and you will have a very, very Frankfurt day. If you can’t make it to Bornheim to the Apfelwein Solzer, there are several apfelwein restaurants in Sachsenhausen that are popular amongst tourists. I definitely recommend enjoying some Apfelwein on your next trip to Frankfurt! How do you describe the flavor of Mastiha to those who have never tried it – bubble gum, pine, woods, a combo of all. It’s truly tough to pin it down to just one word. Tasting is the only way to describe it. “Grown” on the island of Chios in the Northern Aegean, Mastiha has a rather quirky production process. The resin from the tree drops on the ground, hardens and then is collected, cleaned and reconstituted into the nectar that has made its benefits famous throughout history. The list of drinkers range from Hippocrates, the Romans, Columbus, Italian popes, Arabic Sultans and me! After my first sip on a trip to Greece with my boyfriend, I was converted. I usually serve Mastiha after a dinner party to my unsuspecting guests. After the first sip, they are hooked. Slowly, slowly, the rest of the world is learning about it and you can see it being used as a mixer in all the cool cocktails bars. It’s my purchase at duty free from any Greek-speaking nation! Yamas! When the warm weather hits Budapest each April, locals hit Budapest’s outdoor bars like clockwork, emerging from their winter hibernations in search of fröccs. The unofficial drink of summer in Hungary’s gorgeous capital, fröccs is known rather prosaically as a wine spritzer in English. But in Budapest, fröccs is anything but ordinary. The name alone – an onomatopoeic reference to the splashing noise made when pouring the wine and soda water over ice cubes – hints at the refreshment found within. And the number of wine-soda combinations on offer shows just how embedded this warm weather drink has become within everyday summer life. Almost every bar will offer nagyfröccs (large fröccs, made of 2 parts wine to 1 part soda) and kisfröccs (small fröccs, made of 1 part wine to 1 part soda), but some will also offer such creative combos as the sportfröccs (1 part wine to 4 parts soda, for when you want to drink alcohol and participate in sports) and the ‘mayor’s fröccs’ (6 parts wine to 4 parts soda, giving you one litre total of fröccs), as well as countless other combos. When in Budapest, lookout for the telltale pink drinks in wine or highball glasses or glass carafes; rosé is by far the most popular wine for a refreshing summer fröccs! 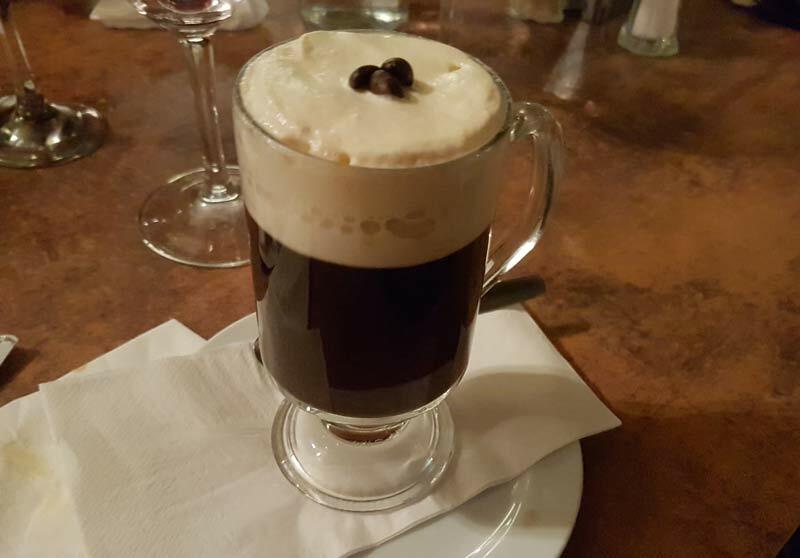 Ireland may be best known for Guinness and whisky, but when it comes to alcoholic beverages in Ireland, a must-try and an absolute classic is an Irish Coffee. Chances are you have heard, or even ordered, an Irish coffee before since they are readily available on bar and restaurant menus around the world. However, there are several variants that make them different than the original. The first step to a true Irish coffee is to use a proper Irish whisky; Jameson whisky is the generally the most popular pick. However, while the whisky is important, it’s not the secret. The real difference between a traditional Irish coffee or an Irish coffee anywhere is the cream. There is a specific technique used to get it just the right consistency; thick enough to sit on top but not too thick like whipped cream. That way the coffee can be sipped through the cream, which is the way it is meant to be enjoyed. Ordering a traditional Irish coffee is a must when in Ireland. Not only is it a delicious treat, but it will warm you up in the damp, cool temperatures. Most pubs across Ireland will offer Irish coffee and, if you’re lucky, you’ll find a friendly bartender than will show you how it’s done so you can re-create your own traditional Irish coffee back at home. Learn the story behind traditional Irish coffee along with an authentic recipe. Check out these great coffee shops in Dublin. The Italians love their bitters. We were introduced to this affinity of theirs during our early years of travel. As we got older, having bitters after a meal to digest or in a cocktail for starters, have become de rigueur. Of these customs, our favorite bitter drink is the Aperol Spritz. In Italy, it is the perennial favorite during aperitivo (a happy hour of sorts, usually set during the time-space leading into dinner, and usually has food offerings accompanying your drinks). Bitters aren’t to everyone’s taste; however, it’s a pretty general consensus that the Aperol Spritz is palatable to all. Maybe it’s because, for most people, the drink is associated with good times. For us, hardly a sip is taken, no matter where we are or what time of day it is, in which we don’t get transported to a square in Rome, under an umbrella, avoiding the scorch of the summer sun. Transversely, it can also transport us to a beach in the Ligurian Coast, soaking in that same sun while avoiding shade. In both occasions, it’s finding quench in that beautiful glass of burned-orange elixir. Fill a glass with ice. Combine Prosecco and Aperol in equal parts, a splash of soda water, and garnish with an orange slice, take a sip, and get transported to your happy place. Sardinia is famous for its gorgeous beaches, its clear waters, its unique archaeological sites and the beautiful cities and villages, but Sardinia food and drinks often get little attention. It is a real pity, as the island produces some of the best wines in Italy; not to mention “mirto,” a strong liquor that can only be found here and in French Corsica (where according to legend it was introduced by Sardinian bandits). Mirto is made from myrtle berries. Myrtle is a plant that is endogenous to the Mediterranean: short bushes that grow mostly near the sea. The liquor is made by macerating the berries, or a mixture of berries and leaves. There’s two varieties of mirto: the white one, produced with white berries, and the black one, with black berries. The latter one is more common – so much so that the generic name mirto commonly refers to this kind. The drink is very thick, strong and quite sweet – locals recommend to drink it sensibly, as it actually gets to the head quite easily. Mirto is most typically enjoyed at the end of a meal, at family occasions – much like limoncello makes an appearance on the table in southern Italy. Nowadays, it is a more common drink to have even outside of meals. Amalfi, a colorful town on the Amalfi Coast, is the place where they have the best lemons in Italy. The hills surrounding the residential area are in fact full of lemon trees that grow thanks to the warm sun and the light breeze from the sea. Here they produce a liquor that has become the symbol of the South: Limoncello. Grandmoms and moms still make limoncello at home. The process is very simple, albeit lenghty, and there’s only one mandatory ingredient. The Amalfi lemons. I have tried the industial limoncello sold in other parts of Italy, and the “real” one. Both because my mom still makes her own Limoncello, and because we visit the Amalfi Coast almost on a weekly basis. There’s absolutely no comparison. The industrial limoncello tastes like sugar and very lightly of lemon. The original limoncello from Amalfi, on the contrary, makes you feel like drinking an aromatic and sweet lemonade. It’s still sweet but not that much, and sugar doesn’t hide the rest of the ingredients. I’m not a drinker, but I can never say no to limoncello, because it doesn’t feel like drinking a liquor… so be careful when you taste it! Here in the Amalfi area we also produce an iced version of Limoncello, with added milk, that has to be served as a deliciously frozen creme. It is becoming a rarity and yet it’s to die for, especially in summer! Limoncello is also used to prepare many traditional cakes and pastries, like the “Delizia al limone”, which is some kind of sponge cake with limoncello, filled with lemon cream and covered with lemon-flavored whipped cream. The best version of this pastry can be found at Sal De Riso, in Minori, on the Amalfi Coast. In Emilia Romagna, Italy, one of the best things to drink is Nocino. And, it’s something many travelers have never heard of before. After a lengthy, multi-course Italian dinner, it is customary to order a dessert. It is also customary to order a coffee, generally a caffè (espresso), which will arrive after the dessert is complete. Then, an after-dinner drink might be ordered. Elsewhere in Italy grappa and limoncello rule the day. But, when eating in Emilia Romagna, they might offer you something a little more unique. In many more traditional osteria and trattoria, particularly in smaller towns, the owner or server may place a bottle of nocino on the table as an after-dinner drink. Nocino is a walnut liqueur. In addition to the hulls of walnuts, when the nuts are still green, the liqueur is infused with lemon peel, cloves, and cinnamon. If the owner or server places it on the table, there is typically no charge for a single glass for each person. If the guests start to get a little heavy handed with the bottle, a charge may appear. One of the best versions of nocino is produced by a balsamic vinegar producer outside of Modena, Acetaia Pedroni. They offer an aged version that is a lot more smooth than the typical version of nocino drank in Emilia Romagna. Riga Black Balsam is a traditional Latvian beverage made with many different natural ingredients and mixed in pure vodka, making it a 45% abv (90 proof) drink. You can drink it straight, on the rocks, in a cocktail, with a mixer like soda water, schnapps, juice, or vodka, or warm in tea, coffee or blackcurrant juice. I was also told that people put it on top of ice cream too. Supposedly the recipe for Riga’s Black Balsam was developed by a pharmacist. It is made up of 24 different plants, flowers, buds, juices, roots, oils and berries prepared in oak barrels. In addition to being a popular alcoholic beverage, some people say it has medicinal benefits and has been known to cure colds and digestive problems. When Catherine the Great got sick during her visit to Riga, Black Balsam supposedly healed her. I knew I had to taste Black Balsam for myself while I was in Riga, so I headed to Balzambars. I decided to try it straight first. I was actually surprised by how much I enjoyed it. It had a bit of a fruity taste and it went down smoothly without burning. Next we tried it in the Clavis Riga cocktail, which I loved. To me, it tasted very similar to a Cosmopolitan. When we went to the Skyline Bar, I had to get another Clavis Riga, it was just that good. We also bought a small bottle of Black Balsam to take home. You can’t go to Porto and not drink Port! Even if you just take a tour of a Port wine cellar with a couple of taste tests to learn a bit more about this drink in it’s namesake city. Despite it’s Portuguese home, it’s said Port was actually invented by the British in response to a combination of a boycott on French wine due to war, and the need to be able to transport wine north without it spoiling. Many of the Port wine cellars still have very British sounding names, like Taylor’s and Cockburn’s, and Graham’s. There are several types of Port wine, but all start from grapes grown in the nearby Douro Valley, the third oldest protected wine region in the world, with many of the vines having been there since Roman times. The grapes grown are no different from those used to make normal wine, but the process used once they’re picked varies. No machinery is allowed in the vineyards themselves, although machinery is used once they’re transported off the vineyards and made into wine. This is then transported to Porto, which was traditionally done on boats along the Douro River, where it’s aged according to what kind of Port it will be. Tawny Port, the most well-known, is from red grapes and is aged in small wooden barrels, Ruby Port is also from red grapes but is aged in large steel vats or barrels, white Port is from white grapes and in smaller barrels again, and a new type of Port, Rose, is from red grapes but has no contact with wooden barrels at all, allowing it to stay a lighter pink colour. I’d seriously recommend trying them all to see the difference in taste and sweetness, and the changes from one Port wine cellar to another. Port is fantastic with cheese, bread, and chocolate, so there’s no better way to spend an afternoon in Porto! One of the most interesting things I drank while is Lisbon, Portugal was a sour cherry liquer known as Ginjinha. It’s a beautiful bouquet of sugar and spices mixed with cherry and infused with Portuguese Aguardente. Enjoy a sample from “A Ginjinha” in central Lisbon, where they also served their liquor with an infused Morello cherry. Don’t be fooled by the sugar and cherries though, while you will taste sweet and sour notes, the aguardente liquor burns going down and cleans the palette. Depending on the region, Ginjinha is sometimes served in a small chocolate cup, a perfect way to end an amazing meal with fellow travelers! Scots have been making whisky for centuries, and you won’t have to venture far into Scotland to get your lips on the famous alcohol known around the world as “Scotch”. Scotch whisky is distinguished from the other whiskeys of the world in a few keys ways. First, Scotch whisky is spelt without the “e” in whiskey – that is reserved for Canadian, Irish, and American whiskies! To legally be called “scotch”, the whisky must be produced in Scotland and aged in its barrel for a minimum of three years. The wait to try the new batch can be excruciating! I enjoy scotch because of the rich history that goes into distilling each and every kind. All scotch is made from the same three ingredients — malted barley, water, and yeast – but the six main whisky producing regions in Scotland each use slightly different methods and resources to produce their whisky. The result is completely different tastes, aromas, and colours from one scotch to the next! Appreciating scotch can take time as you try different ones but there’s typically at least one out there that will suit your unique palate. A personal favourite is Auchentoshan 12 Year or Lagavulin 16. You can find at least one kind of scotch whisky in every single bar or pub in Scotland and in many bars around the world. If you’re in Scotland, be sure to just order a “whisky” because they’ll know you’re probably asking for scotch. Wherever you are having it, be sure to enjoy your “wee dram of Scotch”, as the Scottish always say! Check out our list of whisky distilleries to visit near Edinburgh. There is whisky, there is Irn Bru (a toxic-looking, bright orange soft drink) and then there is Buckfast. If I had to chose the top three national drinks of Scotland (apart from beer) it would be those three. Funny enough, Buckfast Tonic Wine is not even from Scotland. The wine was originally made by monks at Buckfast Abbey in Devon, England – which is where it got its name from. The drink is based on a French recipe and it is still made with almost the same ingredients as back then in the 1890s. Initially, it was sold to be consumed in small quantities as a medicine, but as it is, it soon became a popular drink around the UK and in Ireland. Buckfast wine is caffeinated, contributing to why it is indeed so popular and also so notorious. Drinking it, feels a little bit like holding a glass of wine in one hand and a can of Red Bull in the other, taking alternating swigs. It is quite sweet, but somehow every bottle tastes a little different. There is vanilla in in the recipe used in the UK, but not in Ireland. The amount of caffeine in Buckfast means that it keeps you awake, while the high level of alcohol (14.8 – 15%) means you get drunk even faster. In Scotland the drink has quite a reputation, and is often drunk in combination with rum, vodka or Irn Bru. I can assure you every Scot will have a Buckfast-fuelled story to tell! Pubs rarely sell Buckfast at the bar, so it’s best to pick up a bottle in the shops and try it yourself! When in northern Spain- from Galicia to the Basque region – be sure to sample a glass of sidra or cider, a local specialty. Hard sidra has a very low alcoholic content, about 4% and is made from apples. It has a tasty, slightly bitter taste and is a good accompaniment for fish and other light dishes. There are several requirements for serving the perfect sidra. Since the beverage oxidizes quickly and goes flat, it must be drunk in one sitting. The perfect temperature for sidra is a cool, but not cold 13 degrees centigrade. A bottle of sidra will come in 750 ml, like wine and cost about 4 Euros. The fun part is how you drink sidra. The liquid needs to be aerated so a server will pour it from about 3 feet up into your glass. This is called “throwing the sidra.” Since pouring for such distances can get messy, most sidras are served in sidra bars which are specially designed to drain any excess liquid. In Oviedo, the capital of Asturias province, there is a place called Sidra Street with sidra bars lining both sides of the street. This is a great place to absorb the sidra experience and the sidra itself. Vermouth is the drink of choice in the tapas restaurants and bars of Barcelona. The slightly sweet aperitif was originally invented in Turin, Italy in the late 18 th century as a fortified wine with added herbs and spices such as cinnamon, cloves, quinine, cardamom and others. The popularity of vermouth as a drink grew in the mid-20 th century and then slowly faded with the glow of the 1970ies. But, over the last years, vermouth has made an incredible comeback – especially in Barcelona and the Catalan Region. Back in the days, the local men would drink the aperitif at “la hora del vermut” – every Sunday after the holy mass while the wife was at home preparing lunch. But times have changed. When you wander the streets of Barcelona nowadays, you will see many people enjoy a fine glass of the aperitif at any time of the day. The drink comes in two classic versions: red vermouth is sweet and very easy to drink. It is usually served on ice with an orange slice and an olive. The other version, pale vermouth, is dry and slightly bitter. I prefer the red vermouth but every now and then I also go for a glass of pale to add a little variety. Absinthe has a really bad reputation – as a hallucinogenic drink that will make you crazy. But really, a lot of that reputation comes from the mystery surrounding its ban in the early 1900s. Absinthe was vilified by the temperance movement, but it is actually not much stronger than a glass of red wine. Created as a medicinal elixir in Couvet in the Val-de-Travers in around 1792, absinthe is celebrated in the region now that the ban has been lifted across Europe. The main herbal ingredients are wormwood, anise and fennel, but many other flavours are added depending on the distillery. To serve: to one part absinthe, slowly drip or pour ice cold water (either in a jug or via a fountain) into the absinthe – this is called ‘the louche’. The oils in the absinthe are released and the drink will become cloudy. You can pour the water through a sugar cube (sat upon a special slotted spoon) if you prefer it sweeter. Contrary to popular belief, absinthe should never ever be set on fire, nor should the sugar, as this will taint the taste. Absinthe is a very refreshing long drink that is lovely on a hot sunny day – especially in the beautiful setting of its birthplace in the Val-de-Travers in the hills of Switzerland! Learn the full story behind absinthe. When traveling in Turkey, you will want to try the local liquid refreshment and national drink, raki. Raki is made from grapes and is flavored with anise. It can be likened to other anise drinks such as ouzo in Greece or sambuca in Italy. Raki contains 45% alcohol, and therefore it’s recommended to always enjoy it with food. To drink it, you will have the choice of having it straight up or mixed with water or ice. When it’s mixed, it becomes a cloudy white color, and for those of us that love it, it’s a welcome sight. Raki, due to its strength, is also called “Lion’s milk” and just like anything else to do with lion’s you might want to proceed cautiously. It’s delicious, but it sneaks up on you. Even though Turkey is a Muslim country, most restaurants will serve raki. A typical Turkish meal starts out with a selection of “mezes” or appetizers and the moves on to the main course. Luckily, raki goes well with it all. We recommend heading to your nearest Turkish restaurant, especially one that serves “balik”, or fish, or one that has a large grill called a “mangal,” and ordering a bottle of raki to share with everyone at the table. We are excited to share this extensive list of European drinks with you. These are some of the best liquors, cocktails and wine you can find throughout Europe, and if you manage to try them all, you’re clearly a dedicated world drinker! If we’ve left a special drink off the list that you love and want to share, add it to the comments section below. Order one of these 25 European drinks on your next trip to Europe and drink like a local! What a lethal bucket list to slowly make my way through!! Thanks for sharing! Love this post! Definitely a few I haven’t heard of! There were a few I hadn’t either. Shows how vast the world of drinks is! What a fun post! My new challenge is to try them all.